RayRen: Good afternoon, TNT super-fantastic family! This is Marvelous Monday, May 21, 2018, with yours truly RayRat98 here. Tony: Gooood morning, TNT! It was a long weekend.. Here is the update from Saturday: RayRen98 and Canadians celebrated their birthday, and the Royal Wedding took place! Reuters: Cleric Moqtada al-Sadr’s bloc wins Iraq election (5/18/18). He will not be the PM. Iraqis voted on 12 May to choose their parliamentary representatives. Newly elected lawmakers will nominate a prime minister-designate who will begin the task of forming a government. We also received intel that the new Iraqi government will be determined in three days. Tony: That just came out this morning, right? Here’s the problem with that: it just came out this morning, and an articles said that Sadr and Abadi met and Sadr agreed to give Abadi a second term. Another articles says they met, but Sadr didn’t offer him a second term. Further news says that the government will be announced in three days. All we know is that what we are waiting for should happen any day up to the end of the day. Abadi wants to continue with the reforms; Sadr is putting stipulations on Abadi being PM, including the completion of the reforms. So now Abadi is in a situation that didn’t make sense before the election, and makes less sense now. He didn’t get re-elected, and some people don’t want him to be re-elected, although the US is saying why they want him to be re-elected, and so on and so forth. Why would Abadi take this kind of chance? Because he thought he had a guaranteed win, and now he has to fight to stay in there. It’s not done until it’s done, kind of like the RV. What does this mean for us? I think they will announce it in three days, and that will open the window for the RV. I know an announcement came out saying that trump is doing to make an announcement at the end of Ramadan that will change everything in some way. I don’t know what that is about and I didn’t try too hard to find out, because I don’t think this will go until the end of Ramadan. That’s not the window. For this call…99% positive. Tired of hearing about this… we are way too close to even care.. I am not God. I know people want me to be but I’m not. Don’t run the US Govt or the Iraq govt. Being told that we are being blamed for people’s suicides. And blood on our hands. This is ludicrous to me. Takes somebody ignorant to say something like that. We bring you what we are hearing and try to fill you in as we do. Believe me a lot of things happen in real life and just cause it doesn’t happen to you doesn’t mean it isn’t real. At higher levels people could call up a bank and get in on a Sunday. We are all being privileged right now with information we shouldn’t know for another 6 months. People don’t understand at what level this really is. There are banks turning green right now. I heard from govt officials that they are green. Yes it is about to happen. Could give you bank name and address and then they’d get 20,000 calls and shut it down. Q: We know the RV rate is $3.17 – 4.00 US dollars per dinar, and the contract rate is 28.00 for the US. What is the IQD rate and the contract rate for Canada? A: None of the Canadian information has changed in the last few years. Most Canadian banks are still denying this will happen, unless you find someone in the bank who has been to the training. However, we know otherwise. As for rates, I assume it’s going to be the equivalent of the US dollar rates, allowing for the US-Canadian conversion. Q: Why would we be getting texts rather than tweets? Q: What method have you used to organize your currency for taking it to the bank? We have quite a lot of Dinar, Dong and Zim. Years ago we kept each order in its own envelope with the certificate of authenticity that came with it. Later I was finding it difficult to count it all so I combined the dinar in one envelope and kept the certificates. I am thinking it is easiest to have dinar in one envelope, separated by denominations, with another for dong and another for zim. What do you think? RayRen: I will just carry them in my shirt pocket so it will easy to lay them out on the bank table. Tony: I keep the orders in the original packages with their receipts. I also have copies of all my receipts, and have them bundled together to go to the bank when I go in to discuss the rates, and then exchange at a second appointment, especially Zim. The banks would prefer you to come in and do your exchange in the first appointment; I will shop around. Q: What will it take to make you go away? A: Report me to the court. Q: If one is wanting the contract rate, has over 3M dinar (+ other currencies) and knows that the banks are wanting to get the contract rate to those who have less than 1M, when should one make one’s appointment? A: So, you have three million, and the banks will give preference to those with smaller quantities. We got that from the committee member; the banks haven’t said anything about that. It doesn’t matter how much you take in – they will ask you how much you have overall, because they are supposed to make those decisions based on how much you have overall. They also seem to think the contract rates will run out. They want to give the higher rate to the smaller people so that more people become millionaires than trillionaires. That’s how the rich and influential want to divide it up, but I don’t know that the banks will do it. Ask for the higher rates, because nothing beats a failure but a try. All they can do is say yes or no; there is no penalty for asking, and if you don’t ask, you don’t get. Q: Do veterans have to call the 800 numbers in order to make appointment with finance in order to exchange on a military base? Or do vets just walk in to finance and exchange? Q: I am thinking of investing with AIIB. Are there any broad opinions and advice as far as how would I compare AIIB say to BofA? Q: I am hearing now that the target for forming the new government is early to mid- June which also coincides with the mid-June ending of the MCP. It also is in-line with the June 1st date for the session of the new parliament. A: they just said that the new government will be announced in 72 hours; Parliament is supposed to come back on 19. June. Parliament has to be in session to nominate the President, and then he nominates the PM. None of that is going to happen before 1. June. The timetable gives the longest times they have to do each part of the process. However, they say they want to do this fast. They will negotiate, call in Parliament, announce the PM, and then he has 30 days to come up with a government. I don’t think any of this wills top the RV. The reforms will be completed as rapidly as they can do all that, or maybe as part of the process. RayRen: For live questions, we have a new system. If you really do want to ask a question, press #9 to raise your hand. Okay, try pressing #1. Those who are on the question line without a question will go on my list. 404 caller: About Iraq naming a PM in three days, has that been confirmed? Tony: I just saw it on Iraqi television this morning; I haven’t seen the article yet. Caller: You said last week you were given a time-frame – did they give you a day? Tony: They gave me a window. Nobody is going to know two weeks ahead. People who actually deal with this are not getting an actual day. Everybody in the banks, Forex, and the markets may find out a few hours ahead, so that no one gets caught in a trade. They will give them a smaller window than I have, then they will actually do it. Nobody can give you an exact date and time until that happens. I have heard just what you have been hearing just what you have been hearing on other boards… could go all the way up to Wednesday no one things so – were told it was stopped last week again. On Friday it was go go go. Everyone got the go. Over it’s donw. Pople called from Iraq and they are happy. Verification of lower denoms. Getting from an Iraqi in Iraq. That this portion of it is done. Showed Mailki and Alawi on tv shaking hands. I was told when we saw that it would be done. We expect miracles within 72 hours. I actually told Dan I don’t even know why we are going to have this conversation cause we will never talk to these people again after the next 48 hours. That blood on your hands comment was too much. I will tell you right now I am not accepting responsibility for it. I take that personally. Caller: What is the status of the banks over here? Tony: they haven’t heard it because it was just this morning, and they have not had any alerts. I got my window from the banks. I can’t wait until I can start handing out $1,000 tips – that will really change people’s lives. 307 caller: I’ve lost a lot in the last six years, waiting for this to start. Can you give us anything about when this will conclude? Tony: We only receive the timeframes for when all the parties think this will be released. On the last administration, they gave us information about going back and forth, and specific intel they wanted us to give out. We just want to do the right thing. They had their own plan. People didn’t want Maliki because they knew he was aligned with Iran; our government put him in because of their own perspective, and that screwed up Iraq. The banks believed that they would complete this, and that’s why they had all those trainings and such. Every time I got notification not to leave home, they really thought this would happen. There were seven times in the past year when they stopped it! All we can do is to stay engaged. I know a lot of people over-extended themselves, getting what they could while they can. I don’t care if you lose everything, as long as you have those currencies in your pocket you will come back and regain all that you lost. I cannot tell you what day this will happen, as I said earlier. I get windows from government agencies, banks, exchange locations, from three different countries based on their information. Nobody knows the exact time because they don’t want this to be manipulated. In the closest time, I was given a two-hour window, and it went to ten minutes before being shut down. It’s been an education in how banks and governments really work, and now I have the knowledge to deal with this kind of money to make it last forever. I believe that they had every intention of doing this in December and January, based on where everyone was at. I believe Iraq and the CBI had done everything they need to do to make the US and the world banking system happy. They are now qualified to do the RV, but now the election is in the way. They miscalculated, and they kept adding things to this. The miscalculated the will of the people, just like they did with Maliki. With Sadr live with Abadi? Yes. They still have to play the game, and that’s what they are doing right now. They can go ahead and do it, as long as nothing else goes crazy. Part of that negotiation is the completion of the economic reforms. I do believe in the process, and I believe it can happen in the window I’ve been given. Everything else is already in place. They have the cards, they are international everywhere, and the dinar exchange rate is stable today. In the end we will win, and that will come sooner rather than later. RayRen: You always allow a person to know and understand when they have committed a transgression, and you allow them to apologize for that. Then most of us move on. Most of us don’t know when we accidentally cross that line. I am teaching you how to deal with me, and I will learn to deal with you. Tony, for the last two years I have been answering that kind of question, so anyone else who comes on and asks questions like that, then I do take offense, because the person was not listening to the answers. Next caller: Are all of the banks interconnected like the banks in this country? Tony: Is each country connected? Or are the other countries connected to the US? Every country we trade with is connected to the US. That’s what has just happened in Iraq, that they got connected to the other countries. We are not connected with Iran or North Korea like that, but most other countries we are connected with or to, in the banks. Caller: So… their banks can see our rates and vice versa? Tony: That’s a different issue. Let’s say someone goes to SunTrust; in the past, the only currency screen they could see was their own, but now they can see the currency screen at WF, Bank of America, and so on. They got connected that they could see what they were doing in the different banks. Caller: So will Iraqi dinar be used as a reserve currency? How does that show up on their books? Tony: Yes, and to buy Iraqi dinar. It doesn’t go on their books until we exchange. 303 caller: Would you pay $9,000 per gallon for gas? There is some contract the Chinese made that implies they are willing to pay 9K per gallon, and that is crazy! Tony: when this whole deal was put together with Bush and Cheney, it was only supposed to be the countries that participated in the war who would also participate in the RV. China didn’t, but had a separate negotiation to buy dinars for $28.50, and to use the dinar as a coupon to buy Iraqi oil. They were barred from buying the currency themselves, but this way they can still buy oil futures at $28 per barrel, when the cost right now is pushing $70. It’s still a good deal for China when the US rate is $4. At this point, anyone who wants it to get $28 per dinar, so does it make sense for the US to do that? Because that is the reality of it. Our country is getting oil for $2 per barrel! They can give us $28 and still make money! Caller: How does Iraq do the RV without collapsing their banking system? Tony: That’s what we’re going through right at this moment. When they shut down the currency auction, the banks are out of action. They made their money off the auctions, not through fractional banking. The only way this works is to cut off the auctions at the same time as they give people the education and incentive to bring their cash into the bank, and to pay them electronically. That forces the people to use the banks, and the banks to make auto loans, mortgages, and business loans. Now they have to bring in their currency and receive money on their cards. Caller: So they will also have to change the prices and salaries post-RV, right? How does that affect existing loans? Tony: When the rate changes, ALL the rates will change: prices, loans, rents, all of it. Any monetary figure will drop three zeros, across the board. 702 caller: I was away for ten days, and missed out on the correct information on listening only. RayRen: Go to tntsuperfantastic.com; at the bottom, click on CALL INFO. That page has all the numbers. 513 caller: On the seven times this has been stopped, is that this year or last year? Tony: That was in 2017. I haven’t heard of specific dates it has been stopped this year, although there have been windows when the bank has brought people in, and then nothing happened, and they got upset about it. Often when people are negotiating, at the last moment they will throw something else on the table. Caller: I have a theory about Abadi being the best negotiator ever, and therefore I’m excited now more than ever. From what you told us, Iraq was ready to go from last November. Abadi told this people, but there has been something holding him back on the international level. His Plan B is Sadr. Why else would they publicly support each other? I think he is putting Sadr in as pressure for this go. If they are waiting for world peace, it’s never going to happen. But if Sadr says “I will only support Abadi if this goes through”; if not, Sadr will decouple the RV from the international sponsors. So the US and the world need to let Abadi do this in order for Sadr to support Abadi as PM. What do you think? Tony: I love it! You think Abadi and Sadr came up with the plan; I think the US came up with the plan, because Sadr has been talking to the US since last year, and as a result there have not been protests in the last six months. Everyone wants Abadi to be PM apart from Iran. So if Abadi gets it done, great. If not, Sadr takes points away from Maliki and Amir; otherwise, Abadi might not win at all. Either way, it works because that is one of Sadr’s conditions. Caller: So I am excited, because Sadr only cares about Iraq and its people. 951 caller: So… you feel very comfortable that this will happen by the end of the month? Tony: Yes, I’m comfortable because they told me that two weeks ago. There is a second part I cannot share that makes me even more comfortable. Caller: Sadr wrote “his reform is correct and corruption is eliminated.” I think it is already done! Tony: Yes, the bank reforms are done, and there is stability and security. In that sense, it is done. They just need to activate it. We’re just waiting for them to say Go. I think they are waiting for it to be official that Abadi is going to be PM, then they will let it go. This is leverage to make sure Abadi gets in there. 936 caller: Isn’t Iraq supposed to have a national reconciliation celebration at about the same time as the completion of the monetary reform? Have you heard anything on this? Tony: When they had those celebrations scheduled, that is when it was supposed to happen. I don’t think they will do that again, when it failed to happen – twice. I don’t think that is holding anything up. The only pause now is about getting Abadi back into office. The corruption is the big part, and Abadi has agreed to deal with that. Maliki is part of the corruption, and his goal is now the same as Abadi’s goal or the US’s goal either. They want to make sure that Abadi is in place before they release dinar @ 3,000 x the value. 407 caller: Are you still hearing we can only exchange one Zim note? Does it still have to be a 80/20 split? Is that what’s on the board? Tony: We don’t’ know what’s on the board now. A year ago, they said there would be a cap of 500 million US dollars, over a hundred years. Many people would be deliriously happy with 20% and 5% per month, pretty much forever. The banks said they wouldn’t do it that way because they didn’t want to pay out 100 years into the future. So there may still be structured payouts, but they will be for shorter timeframes, and no 80/20 split. Next caller: Apparently the exchange will be simple and tax-free. But if we take the contract rates, will that be taxable? Tony: Those who do the contract rate now, individually, should not be taxed. Those who took part in groups, and the contact rate with China, they will be taxed 11%. Today’s article says “Rafi Bank issues 50 million dinar in loans for housing.” This is from the bank’s own money; the CBI is not helping them. This is what they needed to do in order to survive as a bank: 50 million for housing, 40 million in car loans. When the rate changes, it will all adjust downwards. The banks are giving out loans so they can continue to make money when the auctions are cut off. They are now stable and secure, so they can give out even larger loans. 503 caller: Is the article saying that Iran will only use US dollars, or only use dinar? Tony: Iran says they would no longer use US dollars because of sanctions. They will only use Iraqi dinars for international trading. People have been smuggling US dollars into Iran, and now they will no longer use those dollars. Caller: Did you say something about trump going to Iraq to make a statement at the end of Ramadan, which is 15. June? Tony: I don’t know that he’s going to Iraq, just that there is an announcement about Iraq. I don’t know what he’s going to say: probably NOT about the economic reform, possibly about the formal end of the war. Trump just re-signed EO 13303 for another year. 209 caller: Will Iran buy a bunch of Iraqi dinar and skirt around the sanctions that way? Tony: Most of them live in Europe, so they are not subject to the same restrictions. There are fake Iraqi banks making millions every day from the auctions, and those banks are owned by politicians. They have millions of dinar that they will take to other countries and turn into billions. Caller: Iraqi has a lot more oil than Kuwait; do you think the rate will be over $3? Tony: That is safe to say. However, there is an agreement that there will not be more than a 20 cent difference between the two, otherwise people will want to move. The rate will probably fluctuate for a while. Caller: I’m not seeing much information about the dong; is there any place I can find dong news? We know it’s about 47 cents now, it will revalue when dinar does. And yet I know you said that if you had a spare $50, you’d buy more dong. Tony: Everyone wants to boost a big currency. Vietnam wants to use the revaluation to boost their currency, as part of China’s circle of influence. Yes, 47 cents makes sense, and a million only costs about $50. Let’s say it comes out at a dollar, and I’ve only spent $50 to receive a million collars, instead of spending a thousand dollars on dinar – which is the better deal? That’s why I favor dinar at this point. The only reason I get any of this information is because eight years ago, some of the players wanted me to get some intel out to my group. Caller: I like the idea of $1,000 tips. Should I add ‘TNT superfantastic’ to the bill? Tony: You can do that, or the name of your family foundation, or whatever you want. The TNT note is so that we can be aware of what we (the members) are doing. Tony: I think Ray hung up, and anyway we are past time. Iran should be announcing the PM by Thursday. I still think this has to go before the end of May. Enjoy your day! 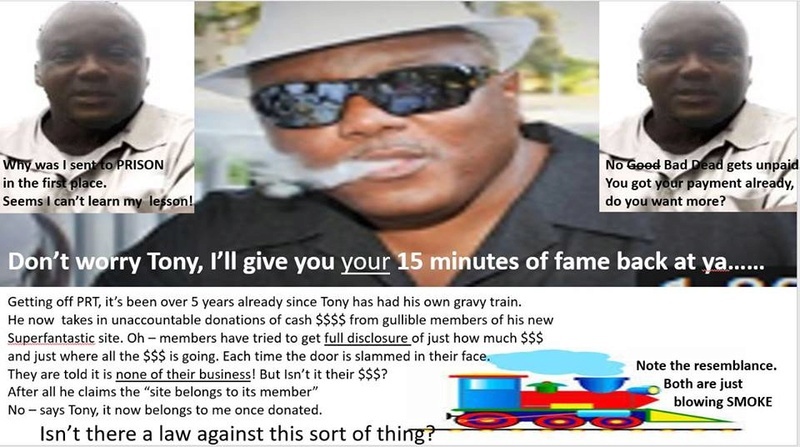 Tony is a repeat offender felon, incarcerated twice for fraud. Ray was prohibited from conducting biz by the IRS, and is a Masonic demon. Other than that, they're great guys who have just been wrong about the RV for 6 years.